Of course, as with any nice car in Maine, in order to keep it that way, it needs to be stored in the winter time. I used to pay for heated storage ($200 a year) but that gets expensive and inconvenient, so I began storing it in my parent's garage about 6 years ago. Because of the layout of the garage, I cozy it into the corner which allowed the main part of the garage to be used as normal. However, this year (2006) I purchased a Station Wagon...which is big. With the Regal and the Wagon in the garage, it was a tight fit. Now I also have a Pontiac Fiero that I have always stored outside in a tent (small). This year, I'm switching things. 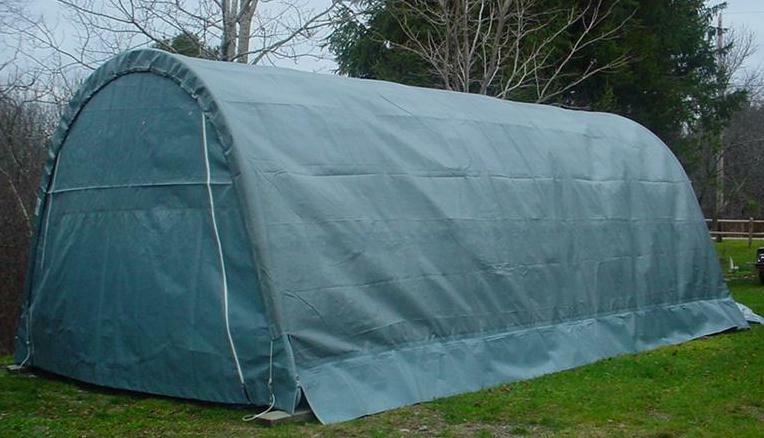 I purchased a new Shelter King tent (12x8x20) and will be keeping the Regal in it. The Fiero will move into the garage, which will leave a lot more space, and my old Fiero tent was sold to my dad who now keeps tools in it. 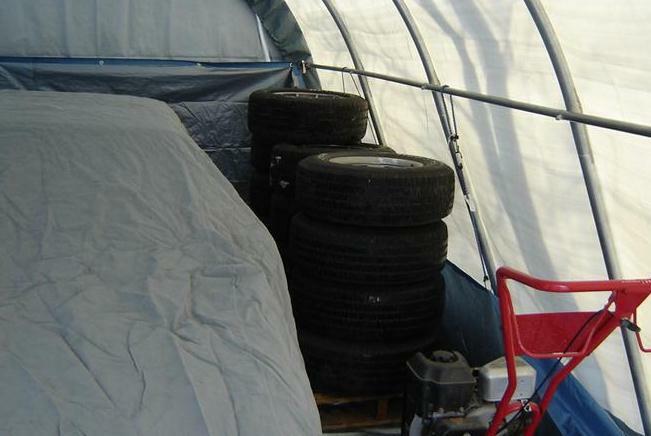 Because of the size of the tent, I can also store all 12 of my summer tires in with my Regal. (4-Regal, 4-S10, 4-Wagon). 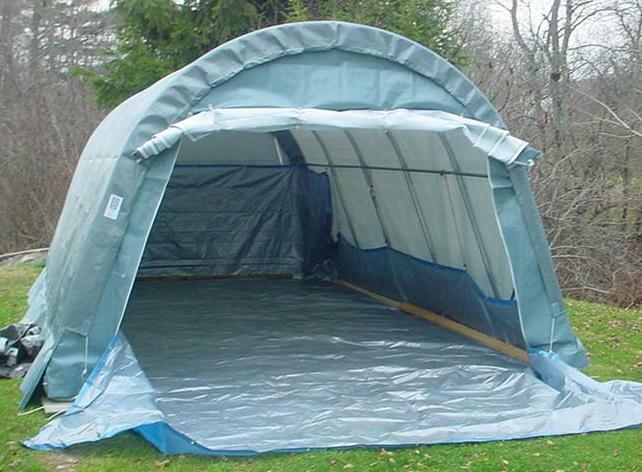 The floor is a 15x30 blue tarp to keep out moisture from the ground. It goes 1/2 up the back wall. This is the back. It has a skirt that runs along the side and has a door on each end. I just plan on keeping the rear door sealed. My old Fiero tent doing garden duty. By April, we'll be ready to go again. I store my car on a set of bald tires and rims and remove the battery to keep it warm in the basement. I do a fluid change before storage to remove any acids from the fluids, but otherwise leave the car as-is. 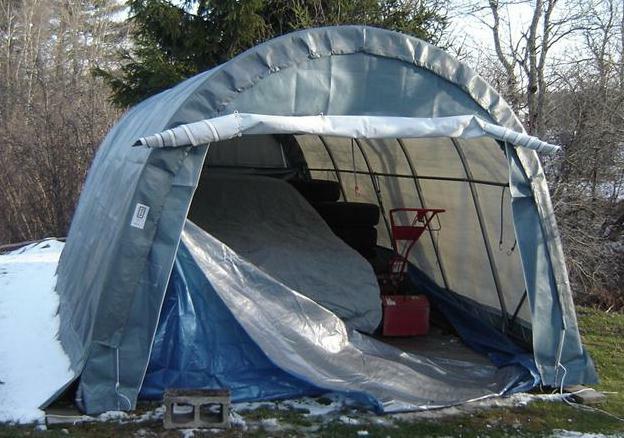 I have found that mice are not a problem with this design, but if it is a warm winter, it helps to keep an eye out for excessive moisture in the tent. Some venting on a dry day helps this problem. Below is my fleet of summer tires I store with my Buick. All 12 of them are BF Goodrich Radial T/A's...the one on the right (13) is a no-name spare GN rim I can use on my S-10 or Regal as a full size spare. They sleep next to my Buick in the tent...along with my garden tiller.